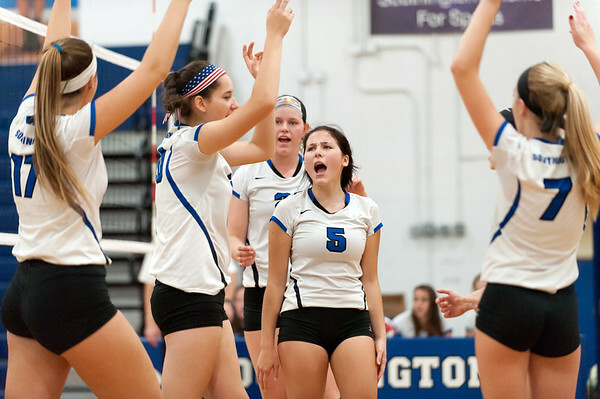 SOUTHINGTON - It’s a difficult task to stop the Southington girls volleyball team. Hall found that out again Monday evening. As has been the case all season, the Blue Knights got contributions from a number of players. Brooke Cooney (13 kills), McKenzie Coppola (18-for-19 serving, 34 assists), Lynsey Danko (12 digs), Jenna Martin (7 kills); Kayli Garcia (5 kills), Keishla Rosario (3 kills) and Maya Lis (9 digs) all turned in quality performances for Southington. The Blue Knights will host their quarterfinals matchup. Wethersfield 4, Newington 0: It was the Indians’ first lopsided loss of the season. Dino Alihodzic and Kennan Mujic each scored two goals for the Eagles (11-3-1), who outshot Newington 20-6. Jack DeGirolamo made 11 saves in net for the Indians (6-5-4). Posted in New Britain Herald, Newington, Southington on Monday, 29 October 2018 20:41. Updated: Monday, 29 October 2018 20:43.